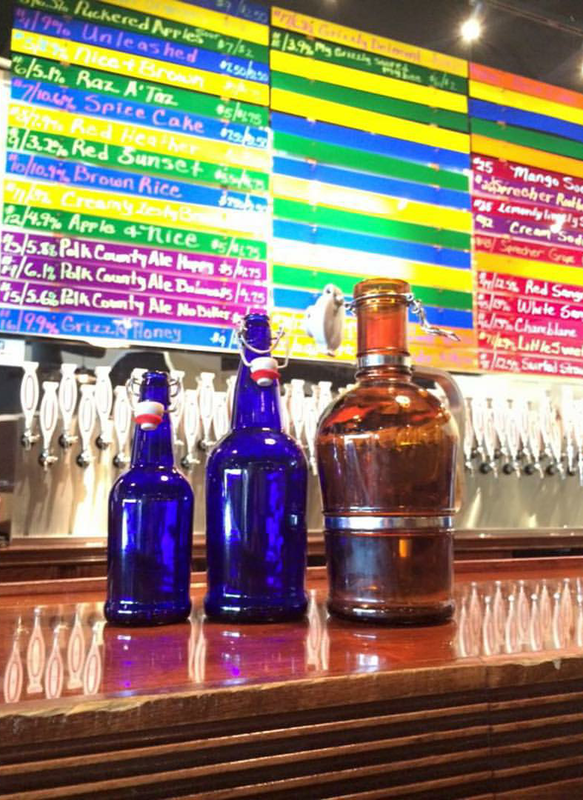 BrewPOP is a brewery, winery, bar, and craft pizza joint located in the small Central Florida city of Auburndale. If you’ve ever driven on I-4 between Tampa and Orlando, Auburndale is next to the old Fantasy of Flight. Firmly entrenched in Polk County, they have a wide range of beers, drinks, wine, and some fantastic looking pizzas. Don’t let it’s location in front of a WalMart fool you; the tap list is lengthy and complex. I recently spoke to Jerry Sowders, owner and brewer at BrewPOP, about the complexities of opening a facility and the joys of a catfish pizza. This is easily the longest interview I’ve ever published, and it’s well worth the read. February 2012. I was continually disappointed by the quality of Barleywine on the market, paying $20 for 10% bombers that fell short on everything except the ABV. The kicker was buying a case of (Dogfish Head) 120 Minute IPA for $300 really lit the fire to push me to brew my own to see if actually could do better than the majority pumping these beers out. Well, I accomplished that and them some. What would you say is your signature beer, and how did it come about? I don’t have a signature beer yet (It is in me still, but I’m trying to bring it out), but a signature style/process, parti gyle. How did you come about finding your brewing space? I started by setting a 1 hour radius from my home, then studying traffic, future area growth and opinions of beer drinkers in the areas over a course of a year. Then I started focusing on buildings that could financially support the brewery. How do you get inspiration in developing recipes and names for your beers? Inspiration comes from many directions. I asked a friend what his favorite food/dessert was, and he stated “Push Pop” ice cream. So, I made him a 9% Push Pop. It was spot on at 60 degrees. Then, one day I was flipping through a Publix publication, and it showcased a ‘Carmel Graham’ dessert. A month later I finished a wonderful Carmel Graham Beer. My latest inspirations come from being in Polk County: Swamp Cabbage beer and alligator pizza, then Lilly Pad Beer and frog leg pizza. I’m hoping to get to these in the next few months. Then next Thanksgiving I am working on a 10% Stuffing beer, 7% Mashed Potatoes beer, and a 4-5% Cranberry beer. Then Turkey Pizza, of course. Names are the most enjoyable part of creating a beer. I created my 4th version of Horse Beer and it was huge in molasses this time, coming in at 11% ABV. Then, I saw a Budweiser commercial and once I stopped laughing at it, the name of the beer became “My Clydesdale quit his job to make this Beer.” I just made an 11% ABV Beechwood smoked beer and I just changed the name from “The Big Beech” to “If Your Bud Had Balls” after seeing one of the many NFL Budweiser commercials. You seem to do a lot of thought about pairing beers with pizzas. How do you go about thinking of a pairing like that? It’s beer and pizza. If you take it seriously, then you have failed. Take to the edge and have fun with it. We have a Margherita Pizza that we soak the fresh mozzarella in a red wine I make; that takes it to the next level. Then our catfish pizza with the Polk County Ale is just a perfect pairing, especially in Polk County. Everyone that sees it on the menu freaks and says that is nasty, but everyone that has ordered it just loves it. Not one complaint thus far. I cannot wait for my rattlesnake pizza with Venom Beer. Frog leg pizza and Lily Pad Beer is going to be fun. Do you find you have to work at converting patrons that staunchly prefer their macro beers? (Laughs) Yeah, that is a major part of owning a brewery. You have to make the ‘security blanket.’ When opening, I had my most popular beers lined up, but I realized I need that crossover beer. So I made the same beer a few ways. One was my Polk County Ale. It’s hoppy and balanced. Then there’s No Bitter, around 6% ABV. The No Bitter has taken care of about 97% of these ‘non-crafties,’ shall we say. Once I have them hooked on the No Bitter, then it is an easy path to the other adventures. I plan to continue this with my next brews, Green Swap Ale, Gator Hop, Croc Hop and Bunny Hop. I always knew opening a brewery you have to have the ‘safe/crossover’ beers. I find this the best part of brewing. What was the inspiration behind the name of your brewery? There are a lot of people getting interested in joining the craft beer industry. Do you have any advice for this people? It does not matter that you have won every homebrewing contest for your Brown Ale 3 years in a row. That does not mean you will be able to open a brewery and prosper, and develop your own twists/styles to keep your brewery fresh and exciting. Craft beer is about creativity, not technically duplicating a BJCP style. Plan your brewery based on a 3 year projected growth. Going in with a 1/2 BBL system & 10 seat tasting room and expecting to make a living in this industry is not going to happen. Set up your brewery so you can brew yourself and have time to run the business, as running the business is 100 times more in-depth and challenging than you expect. Design your system to be able to ½ batches. I have a 20 BBL mash tun that I can brew down to 10 bbl batches, due to my aspect ratio of ~2.3 (2.4 is optimal). This way, you can brew smaller batches to start with, then as capacity grows you can grow with it and not have to start brewing 1-3 times a day and have to continually add fermenters and such. It is cheaper to going in with bigger equipment at the start (if you have the funds of course). The cost difference to go to the next 1-2 sizes up is only a few hundred dollars, but to increase it later on it can be thousands and you are stuck with old equipment that you might not be able to get rid of. The most important of all is to expect and prepare financially for delays of 4 times what you anticipated. Once you are open and on top of Cloud 12 for your accomplishments, be prepared for the haters to crucify your beer at all levels. You need to come to terms with this before you open, learn to embrace the critics and have fun with them. After all, taste is a personal perspective and lack of understanding on the most part (I love educating the critics!). Do you get a lot of homebrewers asking for your opinion of their beers? Yes, I do get several homebrewers in here, and I do give a lot of advice on brewing and my take on brewing. The other day I had over an hour conversation with a homebrewer on dry hopping and explained how to reuse those hops in the boil of the next beer to save money. They were really surprised on this advice. Other conversations are with homebrewers dreaming of opening a brewery. I am quick to level set the realities of opening a brewery, but always encourage opening. I have also been a member of a local homebrewing club for 2 years. In that time, I always kept my opening a brewery to myself. Many members are always talking of opening, but I figured it would be best to keep silent. But since I opened, I’ve only had one club member come in to support me after opening, even though they all have told me they will be in once they found out via the local newspaper I was opening. I found there is a tremendous amount of, shall we say, jealousy towards me now that I am open, or maybe it’s the fact they now have to pay for beers they have gotten for free for so long. It is really sad to see this, I guess I expected more support or acknowledgement. I do plan on suggesting having a competition in the homebrewing club 1-2 times a year on who makes the best beer voted in the club, and then have the winners come in to brew that beer on my system and serve it in the tap room. That will be a lot of fun, but at the same time, I am resentful they are not supporting me. It appears I have to make the first move as I do not want to lose my homebrewing roots which can very easily happen once you go pro. To add to that, I do not like the ‘Brew Master’ status everyone wants to make me out to be. I have mat a few ‘Masters,’ and they are well deserved of the name. I am quick to tell them I am just a brewer that has developed a ratio that pleases the taste palate, not just the BJCP style guideline (I have found that 95% of the people have no clue on styles and prefer taste). Have you considered growing and distributing? I am working on a distribution deal right now, but I am ensuring that I can sign with multiple distributors in Florida. I do not want to get locked into a distributor that has the entire state of Florida locked in. This way, I have the ability to branch out to places like House of Blues or other craft specialty places that will really appreciate the beer I make. Mainly I am planning to do premiere taps for a select few places. I can offer batches from 3bbl to 30bbl a week, so I plan to make beers specific to that location and only sell it there. This way, they will push that beer harder if they have a say in the making of it and their name is on it. Plus, I will have “Brewed by BrewPOP” on the tap to bring them into my tap room as well. I would hope to grow to the next level, but that will be a tremendous step in business to take. Brewing good beer is easy, but dealing with Investors is an entire job in itself. I need to be sure I am cemented well in my current situation before leaping into the big boy sand box. Do you see an end to the recent Florida craft beer boom? Yes. It has to peak at some point in many areas, like any good product. Can you say Cabbage Patch Kids or Pet Rocks? There is only so much room/money to be made from distribution, and there’s only so much space at local establishments & beer drinkers if the number of breweries grow beyond local demand. We should strive to stay local, just like it is done today and has been for generations past in Germany. You look there, every town has its brewery and that is the focal point and reflection of the people in that town. Drink local, be proud!